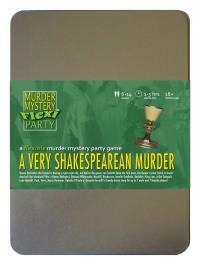 You've been invited to play the role of EDMUND WHITESNAKE in A Very Shakespearean Murder. What scream through yonder window breaks? Queen Derivative the Second is having a right royal ado, but before the guests can forketh down the first oxen, the Queen’s jester Yorick is found dead-ed! Join us to find out who-duneth-it! You wear a short black cloak, black leather tunic, short black breeches, black tights and black boots. Your permanent sneer is clearly visible beneath your black goatee and a long gold chain hangs around your neck. What a great pleasure it is to see such a fine group of nobles assembled. It seems like only last week, young Boulders was licking the backs of rats and now he’s cleaning our cutlery with that same tongue. Forgive my boldness, but should I have murdered that old fool Yorick, I’d have come up with a plan so cunning you could brush your ruff with it, and clearly offing Yorick in plain sight is the works of an imbecile - like Boulders, for example.